NEELCO manufactures, renovates and repairs all pest control, termite and lawn spraying equipment. 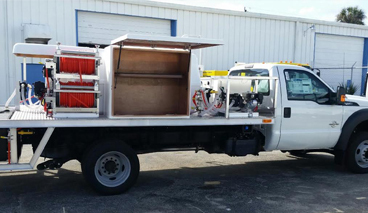 If you are in the market for a new spray truck, we can help you locate, finance and purchase a truck of your choice. Pick up and delivery is also available upon request. Neelco’s fiberglass Premier Storage Boxes are 48 inches wide by 40 inches high, which gives you a beautiful surface upon which to put your artwork. Leak-proof and lockable, they provide plenty of room to securely store chemicals, backpacks, and the tools of your trade. The truck shown here has an external pump and engine with an engine cover. An alternative configuration is to have the pump and engine in one of the Premier Boxes, and the reels stacked in another Premier Box. That leaves a third Premier Box for chemical storage and the fourth for fertilizer storage. An optional under body chemical storage box can be added. 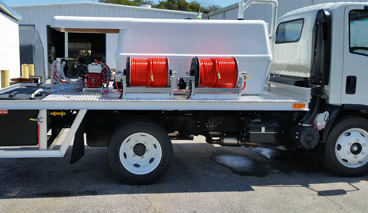 "Neelco sold me a great truck that jump started my company in Brevard County, Florida. I recommend them for truck accessories as well as trucks, especially if you are looking to expand.."
"I had a specific need that was hard to find and the guys at Neelco made a customization that was perfect for my truck. These guys know what they're doing." "I love dealing with the guys at Neelco. They are very helpful and knowledgeable about what works best for my clients." 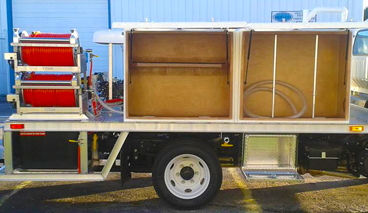 The first step in our consulting process is to gain a broader and deeper understanding of your spray truck needs. We Listen! We believe that preparing a plan before you do anything else will ensure that your truck will be delivered as requested. We Build Your Custom Lawn Care or Pest Control Truck with the correct specs to ensure the absolute best quality. We Deliver the quality you expect from a Spray Truck.